Camping is easy in the daytime, when you're relaxing in a comfy camping chair, drink in hand, quietly watching the world go by, but nighttime will be a challenge unless you’re tucked up in one of the best sleeping bags for outdoor adventuring. If you’ve been enjoying the wilds all day, a good night’s sleep is essential for replenishing your energy levels for another day of fun. That's why it's important to invest in the toastiest, snuggliest sleeping bag you can afford, and one that’s suited to the conditions you’re sleeping in. Lightweight bags also come in handy on vigorous day hikes, where you need to stay warm during rest periods. Get one small and light enough, and you can roll it up neatly on the back of your backpack. In years gone by, T3 has spent far too many a night needlessly shivering due to flimsy gear. That's why we've made it our mission to seek out the best sleeping bags for a wide variety of conditions to ensure you always snooze well outdoors. Although down takes a bit of looking after (you need to store it uncompressed and keep it dry, for example), this material delivers huge bang for buck and is relatively lightweight. So unless you’re training to be a camping porter, we suggest going for the lightest option you can get away with. With that in mind, our top pick for the best sleeping bag top pick the Thermarest Hyperion, a lightweight sleeper with ample room for a comfortable night’s slumber. Keep in mind that in temperatures below zero, though, you’ll need the big guns to stay truly comfortable. We have those listed below too. What are the most popular sleeping bag materials? 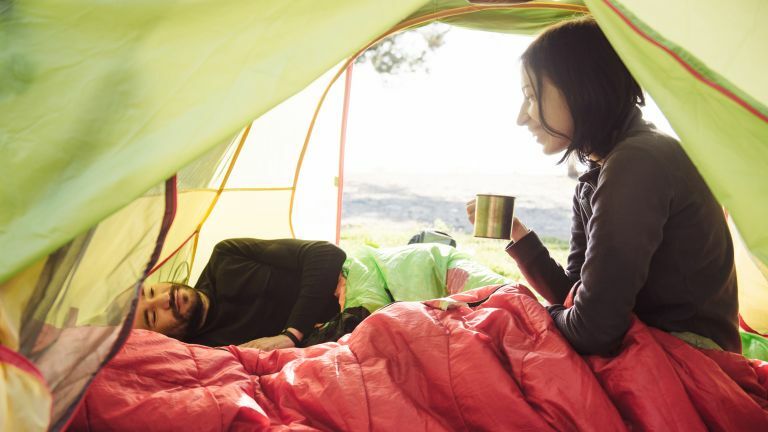 When choosing among the best sleeping bags, it’s best to stick to better known outdoor manufacturers such as Thermarest, Rab, Vango, Mountain Equipment, Mountain Hardware, Montane, Mammut, Patagonia and North Face. These brands will not only have wide ranges to choose amongst, ensuring you get the ideal spec and sizing for you, but they also have strong environmental pedigrees. That means such companies would offer ethical down choices, for example. Should I buy a synthetic or down sleeping bag? Sleeping bags are split into two broad groups: down bags and synthetic bags. Broadly speaking, down sleeping bags offer lightness and unparalleled warmth... Along with the opportunity for you to catch hypothermia if they get soaked. Why? Down absorbs the water, clumps together and provides no insulation when wet. Down bags have evolved a wide range of waterproof coatings and down treatments to try and stave off the damp problem, but these are sometimes only partially effective, and the treatments often lose their potency over the years. With down bags, pay attention to the baffle construction, as better sleeping bags employ a range of funky shaping tactics to avoid all the down clumping together at one end, and to prevent cold spots forming between the pockets. Also keep a sharp eye out for ethical down, down quality (cheaper types will include duck), and fill power. The latter is a measurement of the ‘loft’ you’ll get from 1 gram of down. Better quality down will ‘loft’ (fluff up) better than cheap down, giving you more insulation per gram. Synthetic bags tend to be heavier for the same warmth rating on a down bag, and are usually bulkier in pack terms, but will see you right in the dampest scenario. Artificial down materials like Thinsulate mean that even the wettest synthetic bag will insulate you. There are a host of materials that try to strike a balance between weight, durability and warmth, so it’s worth looking at a few. On the other hand, synthetic fill bags suffer from de-lofting over time, which reduces their warmth. Are the temperature ratings accurate? Be wary of taking minimum temperature ratings too literally – often the lowest temperature in a rating is a ‘survival’ temperature, which just means you probably won’t die if the mercury drops that far, but it won’t add up to a pleasant trip. On a related note, check the fit of a sleeping bag before you buy, as different lengths and chest sizes are often available. The better the fit (you want it to be snug but not tight), the warmer you’ll be. Don’t be tricked into thinking you’ll be wearing more than just base layers in a sleeping bag, either, as extra clothing changes the fit of the bag and makes it colder! If it's nippy out, lay jackets on top. The Thermarest Hyperion is squarely aimed at those covering ground, where weight is of vital importance. An astonishingly light 1lb, and the packsize of a large water bottle, this is one for the fast and light crowd, as well as anyone who doesn’t like lugging heavy loads. The specs are strong too, massive 900 Fill Power ethically sourced Nikwax Hydrophobic Goose Down ticks all the boxes, while a RipStop shell and inner lining, which also has ThermaCapture Lining to trap more heat all add up. Finally, neat touches like the synergylink connector, which straps the bag to a mat, really make this stand out. The North Face Gold Kazoo is a solid choice for 3-season requirements, it’s got some different design cues to mark it out from the crowd, and neat touches that will keep you warmer and happier than a cheaper competitor. The ethically approved 700 fill ProDown is hydrophobically treated, keeping it drier and warmer for longer, while anti-compression pads are designed to keep you more insulated from the ground - a cunning plan, as that’s where you lose most heat. A well-thought out fitted hood and zipper baffle combine with a draft collar to combat heat loss for minimal weight too, and there are even pad loops to connect the bag securely to a pad - ideal for springtime bivvying. An old favourite among the camping fraternity, the Ghost Whisperer is packed with 900-fill-power goose down, and is ‘QShield’ treated to combat the dreaded damp. A 10D ripstop fabric two/three-season bag with a lower rating of 4 degrees, the Mountain Hardwear's is widely considered to be one of the best sleeping bags around because of its impressive lightweight and extremely packable design. The Ghost Whisperer bag is aimed at alpine-style mountaineering types, as well as hikers who want to stay warm at night without paying a hefty weight penalty. It’s not a new sleeping bag, but the classic Mountain Equipment Iceline has graced many an expedition to very cold places, and rightly so. It keeps you relatively comfortable down to a frigid -30 degrees, thanks to 994g (minimum fill power 800) of 90-10 Russian Goose Down, all wrapped in a rain-resistant and breathable Gore Thermium 10D outer shell. All that makes this the best sleeping bag for cold weather camping. Mountain Equipment has gone to town with the baffle design, packing in a variety of shapes in different areas to maximise loft to keep you warm. An anatomically shaped hood hugs your head, and a neck collar provides a snug yet soft fit. The fact that the Iceline comes ‘expedition fitted’ (so it’s roomier than usual) is another reason why this serious bit of camping gear is top of our best sleeping bags list. When you’re done using it, just roll the bag into the supplied waterproof roll-top stuff-sack. A stone cold classic, for years the Vango Venom has been a byword for budget-friendly lightweight sleeping bags. Boasting considerable technical assets for a minimal spend, it’s no surprise that this bag is recommended by DofE groups. One of the cheapest picks in our best sleeping bags guide, the Venom 300 brings with it a box wall construction, which ensures an even distribution of warmth once you're nestled inside it. The ethically sourced hydro barrier-treated down (at 700 fill power) is teamed with a durable, water-resistant mini ripstop 30D nylon fabric. It'll see you through sprint to autumn without a whimper. The Mammut Tyin might not be the lightest winter sleeping bag, but the artificial insulation is a definite win in anything other than very dry conditions… Or in other words, anywhere in Europe. Not only are there three layers of insulation in the main sleeping bag, there are additional layers in the foot box to stave off those dreaded midnight chills. As well as shrugging off general dampness, the Tyin bag is made from robust Polyamide, so it will last you many a camping trip. This best sleeping bag contender is also rated for washing and tumble drying at 60 degrees, so you can get that expedition musk properly laundered out - something that down bags are usually much less tolerant of. The HyperLamina Flame is an excellent choice for potentially rain-lashed camping, as the synthetic insulation keeps you warm regardless of how wet it is. This sleeping bag is no technical slouch either, packing in a half length centre zip, a face gasket and Lamina welded construction. Another reason why it's routinely considered to be one of the best sleeping bags money can buy is something called mapped insulation. This clever design works to keep heat in and weight down. The Montane Deep Heat Sleeping Bag delivers on two key fronts: it’s very warm and, at a shade over a kilo and a half, it’s pretty lightweight too. In addition, Montane have deliberately designed the bag to work in cramped conditions, such as bivvy sites where sitting up might be the most relaxed you’ll get. Not only is there an internal stash pocket for any batteries you don’t want frozen, there’s also a water bottle pocket, which means your Nalgene can be a hot water bottle at bedtime, and still be unfrozen by dawn. Do you have a romantic camping trip planned with your partner? If so, this is the Rolls-Royce of sleeping bags; a comfy double duvet big enough for two. With a slightly optimistic comfort rating of -2, Outwell's Constellation Lux Sleeping Bag will be ideal for car camping in late spring, summer and through to autumn. Rather brilliantly, the bag also zips apart into two separate sleeping bags... This might come in handy if you discover that your partner is actually far too wriggly a sleeper to share such a cosy space with. The Rab Ignition 2 is a light-weight, yet burly, packable synthetic insulated sleeping bag that will serve you well for three-season camping trips. The synthetic fill makes it ideal for inclement conditions, while a plethora of robust materials – including a 30D ripstop outer fabric and YKK zips – add up to a bombproof package of warmth. A classic mummy shape makes up the design, hugging your body without restricting movement too much. There are left and right-hand zips available, depending on your personal preference. Unless you’re going full winter camping and need super-warmth, the Thermarest Hyperion takes the cake with it’s attention to lightness. Light is right as the outdoor experts say, and for less than half a kilo the Hyperion is impressively warm and fully-featured. Down does require a bit of care, but it’ll repay you in both the short and long term once you master it. That said, if you’re planning to be very cold at altitude, the Mountain Equipment Iceline is a proven, bulletproof hotel in a bag. It’s not light, and it’s not small, but if temps are the wrong side of zero, you’ll be very glad you carried it out there.